TRISCUIT crackers and I go way back, you see, I've never been much of a potato chip kinda gal so my mom would pack some crackers along with her famous grape and cheese kabobs (a genius invention if you ask me) in my lunches. 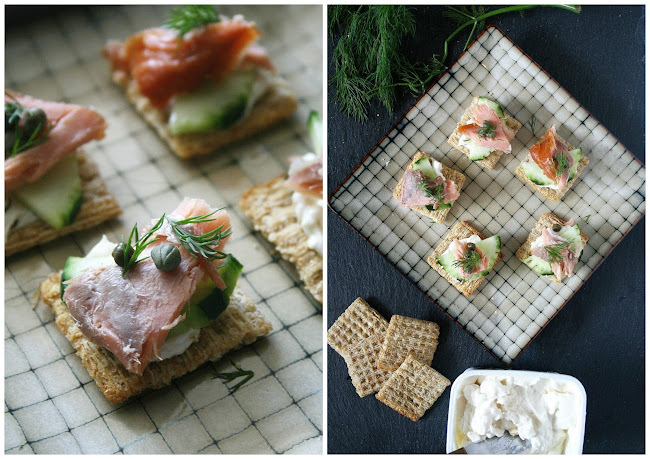 To this day I still enjoy snacking on TRISCUIT crackers but instead of mindlessly eating them out of the box (which I often do) I decided to get a little creative and combine my favorite seasonal ingredients to make some party pleasing appetizers. I headed over to my local Walmart and picked up my favorite flavors including: TRISCUIT Original Crackers, TRISCUIT Cracked Pepper & Olive Crackers, and my new favorite, TRISCUIT Smoked Gouda Crackers. With endless choices of seasonings and spices they provide the perfect base to build any small bite. Some things to keep in mind when creating your appetizers is you want a balance of flavors and textures - sweet + savory, rich flavors + fresh herbs, crunchy + smooth, you get the idea. To assemble each recipe simply follow the steps starting with one and working your way up. For mine I used similar ingredients with different proteins and it only took me a little over 30 min. to assemble all three so whipping these bad boys up for a party would be easy! A new spin on the classic deviled egg, this is the ideal breakfast food bite. The perfect balance of tart, savory, and slightly sweet. *Side note: I learned through many a fallen apple that you should slice the apple thin, place it on the cracker, then top with bacon (duh Annie). One of my all time favorite ingredients, smoked salmon, pairs perfectly with cream cheese, salty capers, and refreshing cucumber. What are some of your favorite flavor combinations? Are you more sweet or savory? 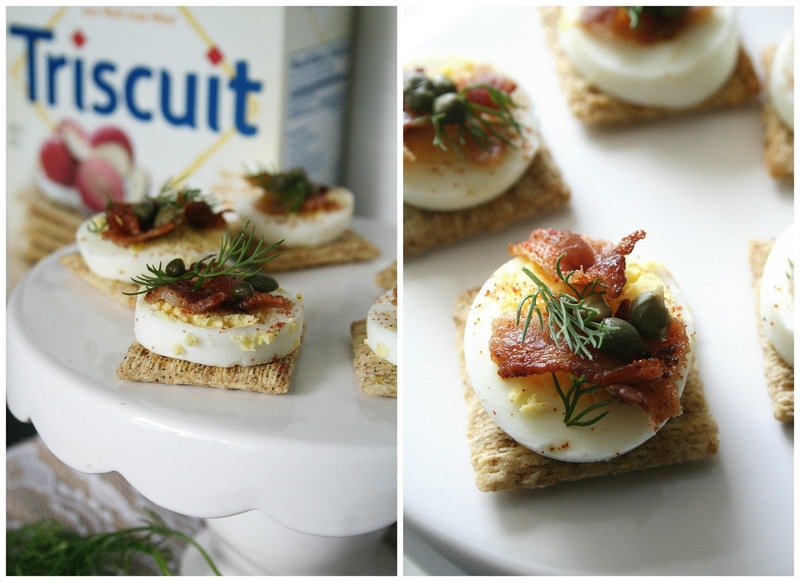 For more inspiration on awesome apps, check out the TRISCUIT webpage and show off your creations with #MadeForMore.